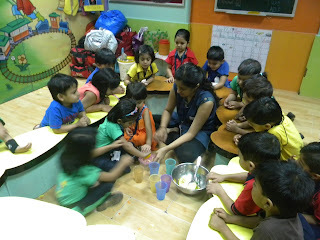 On Wednesday, 6th March 2013, children of Nursery section made sweet lime and orange juice as a part of their cooking experience. 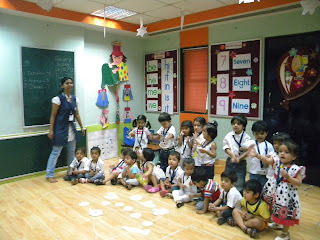 Children were divided into 2 groups. They had brought sweet lime and orange to school, and with the help of the teacher children squeezed the fruits to make juice, which was later served to them. 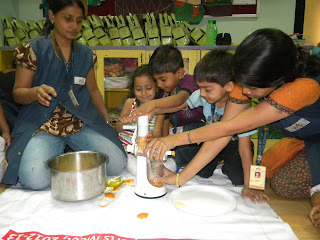 Children loved the sweet and sour taste of the juice. Every month WIS plans for the field trip according to the theme. 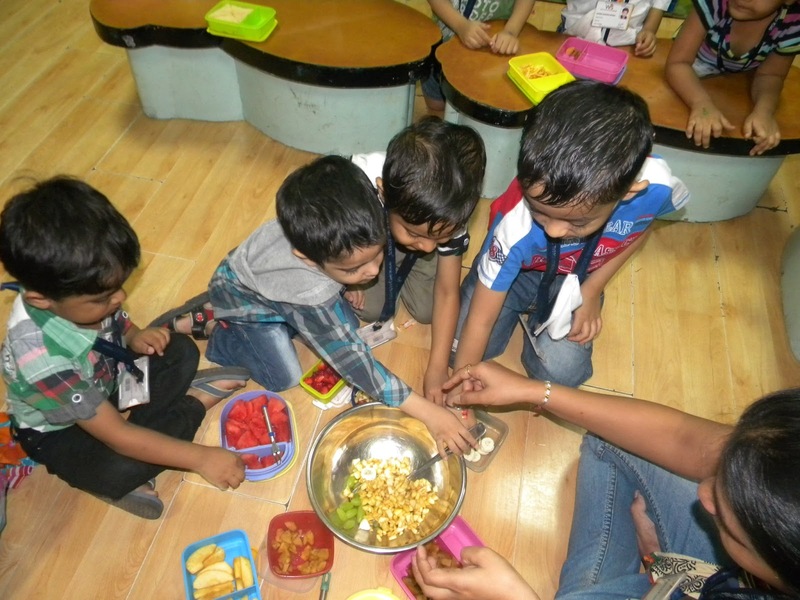 This month the theme is fruits and vegetables. 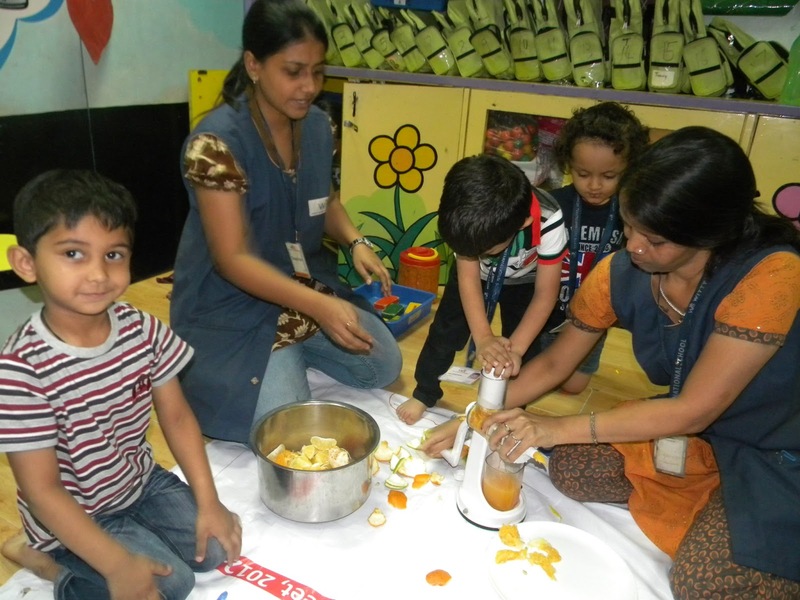 Therefore, the children of Nursery were taken to Dmart to show the set up of a market with real fruits and vegetables on Tuesday, 19th March 2013. Teacher gave sufficient knowledge about the colorful fruits and vegetables to the children. It was a fun and knowledgeable trip for the children. 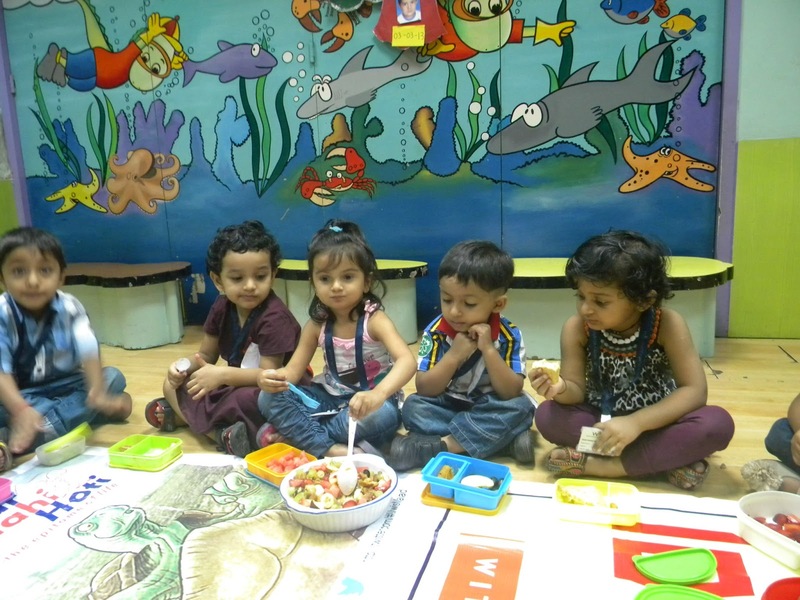 Wednesday, 13th March 2013 was celebrated as Fruit salad day by Nursery section. Fruit salad is a dish consisting of various fruits. Here in WIS we made fruit salad as the theme for the month of March is Fruits and Vegetables. 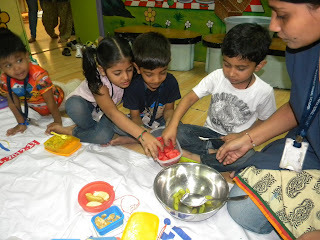 Children brought variety of fruits like watermelon, orange, banana and apple in their tiffins. 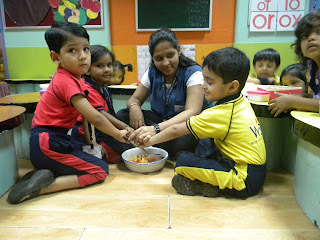 During snack time children took turns to mix the fruits they brought in a bowl. 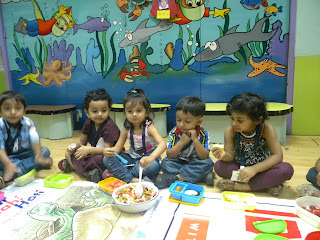 Not only was the fruit salad yummy but was also a healthy snack treat for children, which they all enjoyed. "Some people dream of great accomplishments, while others stay awake do them". This quote rightly fits to Divyanka Choudhary of class II - A , who with her meticulous and sincere efforts, earned the first Wittans star on Wednesday, 12th March. This day is marked as a golden day in the history of Witty International School, Bhilwara. This little angle with a golden crown was looking extremely charming and had a feeling of pride as she earned maximum book marks in different competencies. Her proud father was also present to witness and share the glory of the moment. She was appreciated by everyone with huge applause and warm wishes. The 11th Annual Sports Meet- 'Synergy' 2012-13, was celebrated with great fervor and excitement on Tuesday, 22nd January 2013 to make the 11th Glorious year of the Pre-primary section of Witty International School a grand success. 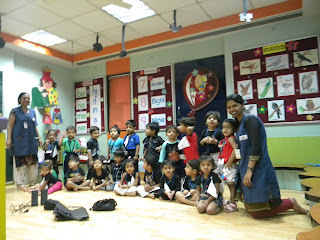 The guest of honour were Mr. Shlok Ramachandran and Ms. Snehal Bal. The highlight of the programme was the formation of the letters 'W' ( for Winners) and 'V' (for Victory) on the ground through the drill exercise performed by Sr.Kg and Jr.Kg sections respectively. 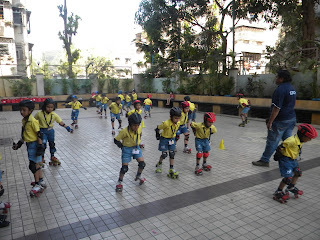 Various other events included march past, flat race, obstacle race, child-child race and parent -child race were held. In the end, as goes the tradition, all the children were presented with a medal and a participation certificate. The programme then closed with the National Anthem. It was time for another field trip and as the theme was flowers and insects , the little children of Playgroup were taken to the Garden on Friday, 15th March 2013. 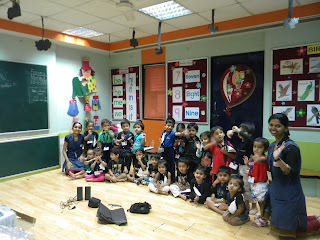 Children sang their way to the garden, all euphoric and excited in anticipation. Children were very happy to see different flowers and butterflies at the garden. Children had a great time playing on the slide and swing. They happily munched on the biscuits given to them from school on their way back to school. A skating camp for Sr.KG C and D was held for the month of February. Special trainers were invited to train the children for the whole month. A special show was organized for the parents on the 8th of March which was the last day of the camp where the children performed with great energy and excitement making it a great show. WIS believes in grooming students in all aspects of life including studies and co-curricular activities. The school believes that each child is unique with one or more talent. To groom their talents the school provided a platform to the little children of Sr. Kg by organising a programme called as "Sparkles" on Saturday, 16th March 2013 in the school premises. In this programme the children participated in various categories like dancing, recitation, singing etc. 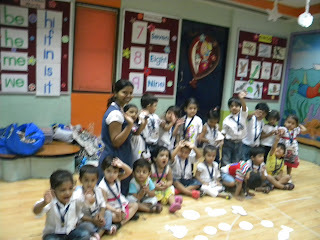 The Principal Mrs. Shubha Govil congratulated the little children for their confidence and zeal. The Director Mrs. Preeti Sogani appreciated the budding talents & motivated them to confront the world better day by day with the same vigor. 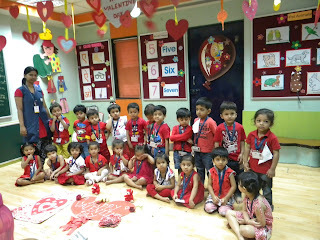 On Thursday, 14th February 2013, Playgroup and Nursery section celebrated Valentine's day. 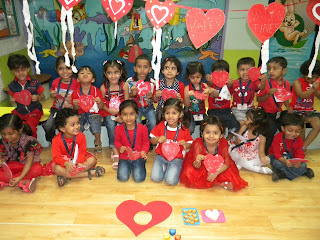 All children and teachers came in their bright red colour dress. 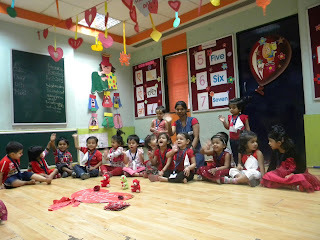 Teacher decorated the class beautifully with red colour hearts and flowers. Children brought heart shape snacks in their tiffin like biscuits, cutlets, parathas,chocolates and fruits cut in heart shape. 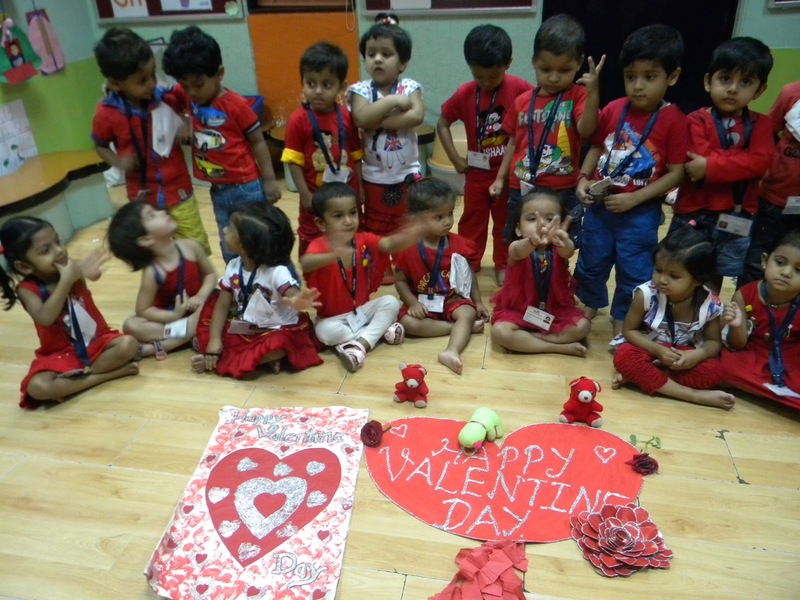 Playgroup children enjoyed playing passing the heart game whereas Nursery kids made heart shape card for their mummy and papa. 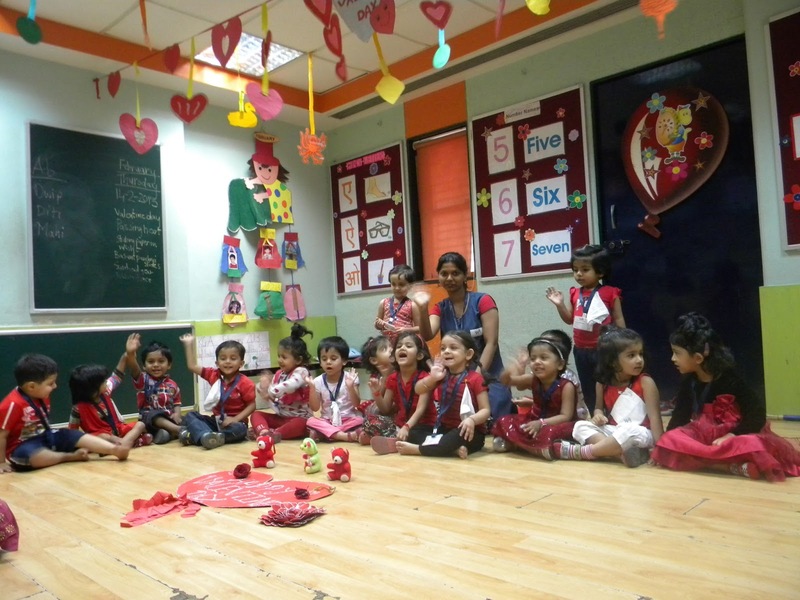 Children shared their love and affection and made it a memorable Valentine's day. In keeping with the ongoing concept of day and night, the children of Playgroup celebrated Black and White day on Wednesday, 27th February 2013. Children painted the stripes on the zebra worksheet. Teachers and children enthusiastically participated in the black and white game. After the introduction of white color, it was the time to introduce black color. came in their black color dresses. 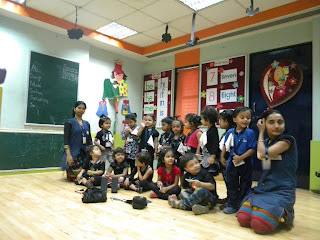 The children were introduced to the beauties of black color through different objects. Teacher explained about beautiful black night. 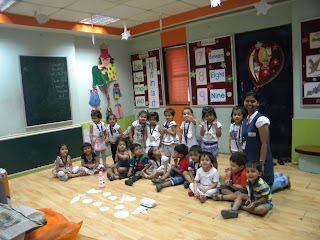 Children made night scene by sticking black and silver paper on the worksheet. White day was celebrated on Friday, 22nd February 2013. White is the color of purity, peace and innocence. The little children were looking like angels dressed in pure white. 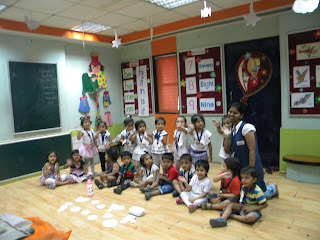 Class was decorated beautifully with white color objects. 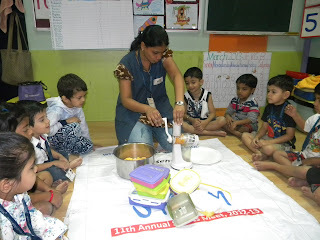 Children did white color sponge dabbing to make a moon. Children enjoyed the white day celebrations. 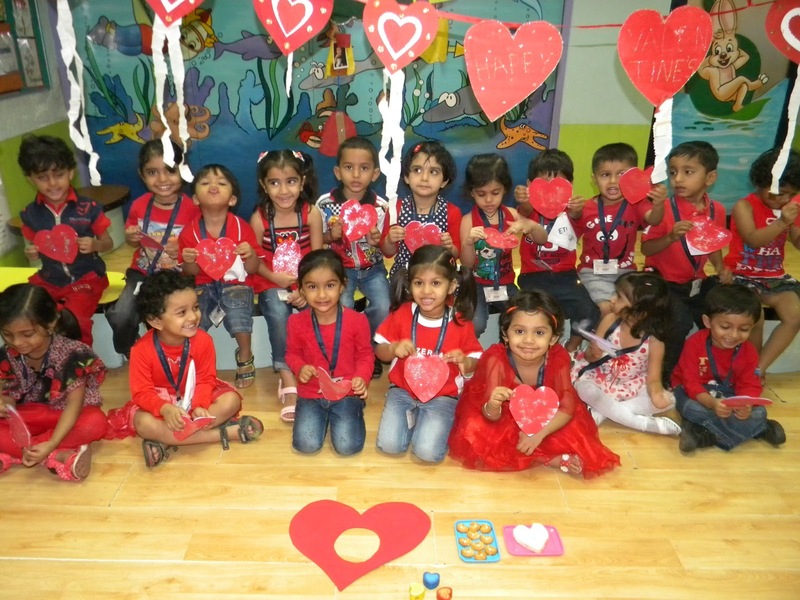 The Nursery section celebrated their Heart Shape Day on 12th February, 2013. 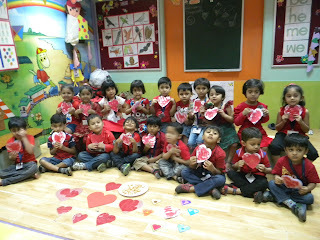 The classes were decorated with heart shapes. The teacher introduced the shape through a story and showed various heart shape objects.Children had brought various heart shape snacks. 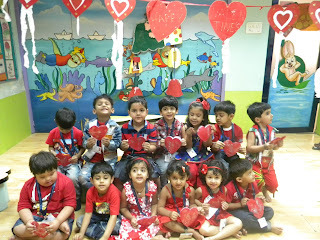 The children saw and enacted the poem Queen of Hearts. Few children were selected from the class to be dressed up as the King, Queen and Knave. Overall it was a good way of introducing the shape.The children enjoyed seeing the various heart shape objects and enacting the rhyme.